It's the end of an era. . . But now he keeps hanging around things that are blue. . . I'm sure the farrier and his son, who are overdue to come out and give Donkey Doodle Dandy another pedicure, will be just thrilled to learn they'll once again have to catch him up while he's completely naked, and thus lacking anything for them to easily grab onto. The farrier was sure that by the time he returned I would be effortlessly leading my fully trained "little Dandy" around by a rope. Maybe I would even have him pulling a cart! Um, not exactly. Click here if you're wondering what this is about. A year of Farm Photos ago, with lots of daily lamb reports in there, too. Catching up again with these, though I'm still behind answering your comment questions and replying to e-mail. Thanks for your patience! This photo, which I first posted back in April, is one of my favorites because it always makes me smile. I felt a slight twinge of guilt as I pulled out my camera and snapped it, telling myself that I really should have been rescuing Snugglebunny. She wasn't in any immediate danger, though, and was actually quite calm. She just stood there, moving her head slowly from left to right, right to left, as if trying to somehow see around the bucket. There was no frantic thrashing about or racing around in a panic. Snugglebunny has been in this predicament before. I'm glad I took the few seconds to capture this moment because apart from it being so funny, it now has a special significance. You see, when Snugglebunny wasn't looking, I did a little switcheroo. This was after I had removed the bucket from her head of course. Farm Photo 5/12/07: Just in time for Mother's Day. . . Seven years old, and suddenly she wants to hatch an egg. She's been sitting in that nesting box nearly 24/7 for a week—on an unfertilized egg that isn't even hers. And I have noooo problem with that. June update: Whitey got her wish! Sharp Deal On KitchenAid Knife Set! I don't usually admit that I've been lazing about, shopping online when I should be doing 44 other things around the farm, but if there's a really great bargain involved sometimes a girl has to make an exception. I'll cut to the point (sorry, couldn't resist). Fifteen minutes ago I had no idea I desperately needed a new knife set, but apparently I did, because I just ordered one from Amazon.com. How could I not? 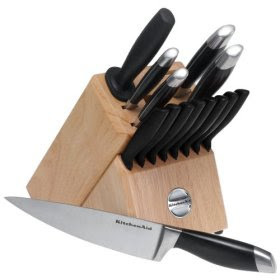 It's a KitchenAid 16-Piece Cutlery Set In A Natural Wood Storage Block, regularly priced at $139.99 but on sale today only for $39.99--and it comes with free super saver shipping. A hundred dollars off is always very nice. Sunday 5/13/07 update: It's on sale today for $49.99 plus free super saver shipping--still a great deal. Click here to read more about it or to place your order. I wouldn't normally recommend something that hasn't even arrived yet, but again I'm making an exception because I thought it only fair to alert you to this one day deal. The set includes an 8-inch chef's knife, 8-inch slicer, 8-inch bread knife, 5-1/2-inch utility knife, 3-1/2-inch paring knife, 8 steak knives, kitchen shears, a sharpening steel, and a handy dandy wood storage block. The handles are available in black or a fun bright red. I ordered black, but I was this close to choosing the red. I've been extremely happy with the other KitchenAid products I own (you know I'm crazy about my immersion hand blender), and since this collection is backed by KitchenAid's hassle-free, one-year replacement policy there's really nothing to lose. It would also make a wonderful gift. Hmmm. Maybe I should have ordered two. No matter how you slice it, this is a fantastic deal. Ouch. Oh my. It must be KitchenAid super sale day at Amazon.com. I just looked at the immersion hand blender in my Farmgirl Fare Favorites Amazon.com store, and it's been reduced from $49.99 to only $29.99 and includes free shipping. Wow. I've never seen it priced that low before. Now this is something I do already own and very highly recommend--in case you missed the 20 or so times I've mentioned it in previous posts. You can read more about it here. This, too, would make an excellent gift. Okay, I think I'd better head out to the front field and check on the sheep before I find any more deals--or have to come up with an explanation as to why we now own two KitchenAid immersion hand blenders. Joe doesn't even know about the knife set yet. With over 82,000 Google hits for "no-knead bread," there are no doubt thousands, perhaps tens of thousands, of people who overcame their fear of yeast, baked their first loaf of bread, and were thrilled with what they created. How cool is that? But once we decided to include it, we had to figure out what to do with a loaf that's had pretty much anything you can think of already done to it. Beth ended up turning hers into a nutty oatmeal cinnamon swirl toasting bread. Kevin used his dough to make English muffins--and learned a lot in the process. I took my version of the basic recipe I've been making and gave it an Italiano twist. Then I sliced it up and made one of the best grilled cheese sandwiches I've ever eaten. If you haven't yet heard about this no-knead bread, you're in for a simple, scrumptious surprise. If you'd like to start with my basic version (click here to see a photo), just follow the Italiano recipe but omit the herbs and spices. If you're one of the zillions of people besides me who fell head over heels for this loaf and wrote about it on your blog, leave us a link to your post in a comment at A Year In Bread, and/or post a photo at the A Year In Bread flickr group. I'm Farmgirl Susan on flickr if you'd like to add me as one of your contacts. Just joining in? The first bread we tackled at A Year In Bread was pizza dough. You'll find my recipe here, Beth's here, and Kevin's here. And today's post is full of some of our favorite bread baking tips. So what are you waiting for? If you're ready, breadie, then come bake bread with us! © Copyright 2007 FarmgirlFare.com, the award-winning blog where Farmgirl Susan shares photos and stories of her crazy country life on 240 remote Missouri acres - and everything's better with homemade bread. I eat a salad nearly every day of the year. And while anything green, leafy, and not poisonous is fair game for my salad bowl, lettuce holds a special place in my heart, and I always grow numerous varieties of it in my kitchen garden. But since daytime temperatures on the farm are already hanging in the mid-80s and threatening to go only higher, it's obvious that we're quickly nearing the end of a lovely but all-too-brief spring lettuce season. In many places, however, there's still plenty of time to plant. Click here to learn how you can go from seed to salad bowl in less than a month, no matter where you live (well, unless it's here, in which case you'll have to wait until fall to sow your seeds--but once you do it'll still be less than a month before you'll be able to start harvesting). Need a little help getting growing? The Vegetable Gardener's Bible by Ed Smith has been my favorite gardening book for the past 7 years, and I highly recommend it for kitchen gardeners of all levels. Click here to read my review of it. P.S. Oops! I somehow forgot to include the photo of Cary eating her birthday popcorn in Sunday's post, but it's there now. Click here if you'd like to take a look. © Copyright 2007 FarmgirlFare.com, where Farmgirl Susan shares photos and stories about her crazy country life on 240 remote Missouri acres. Cary Is One Year Old Today! Hip Hip Hooray! It's Cary's Birthday Today! Don't know who Cary is? Click here to read her story--or to read it again if it's been awhile. Dan has adored Cary since the first time they met (well, most of the time anyway). Because life on the farm is full of the unexpected, we tend to shy away from making extravagant plans for holidays and other special occasions. Instead we'll end up taking an afternoon off, or cooking up a special dinner, or opening a bottle of champagne (or all three) simply because, as Joe likes to put it, "It's Tuesday." Or it's snowing. Or there's a full moon. Or the first tomatoes are ready in the garden. You don't have to look hard around here to find a reason to celebrate. And so, in that tradition, Cary's birthday has been a rather quiet one. I spent some time poring over baby pictures, smiling and sniffling as I relived the past year. And several times during the day I went outside and just stood with Cary while she ate. Okay, okay, I stole some hugs and kisses, too. There may not have been a lot of fanfare, but everyone definitely ate well, because today was officially Sheep Freedom Day. We've been warming up for it all week, as the sheep were already spending each day in a large fenced pen across from the barn. As I type this, though, 90 woolly beasts are outside and on the loose. And while I have no doubt whatsoever that little foodie Cary (aka She Of The Always Empty Four Stomachs) would have taken a breather from frantically munching on sweet spring grass to eat a cake if I had baked her one, I opted instead to sneak her a bag of one of her very favorite foods--popcorn. She didn't inhale it in two seconds like she used to off the hardwood living room floor, but that was only because today it got stuck in between the blades of grass, forcing her to nibble on them as well, and that took a little longer. For the most part, Cary adapted very quickly to life with a two legged mother. When she was very small, though, I would call out to her and she would often look at me in confusion. You could tell that her baby sheep brain was sending her mixed messages: This smells and sounds like your mother, but she should really be a lot shorter and wider and woollier. As Cary grew up, my fears about her not learning how to be a real sheep went completely unfounded, and she slowly adapted herself back into the flock. It is truly amazing to watch animal instincts at work. If somebody looked at Cary for the first time today, they would never be able to tell that she once had a badly broken leg. And if that somebody wandered among the sheep with me while they were out grazing, they would never be able to tell that, for a while, one of those sheep spent every waking moment of her life with me--working in the garden, lounging on the daybed in the living room, curled up at my feet while I sat at the computer. But I know, and Cary knows. She's all grown up now, but once in a while, when she turns her head just so, like she did this afternoon, I can still see the baby in my little girl. Happy Birthday, baby. It's been a year I will never, ever forget. And it's been wonderful to have shared it with so many of you. Click here if you'd like to revisit some of the many previously posted Cary photos. © Copyright 2007 FarmgirlFare.com, the award-winning blog where Farmgirl Susan shares stories & photos of her crazy country life on 240 remote Missouri acres. That Big Sheep . . . The One Who's Pushing All Those Baby Lambs. . . Guess who's turning one year old tomorrow! Don't know who Cary is? Click here to read her story. The First Radishes Are Ready! Always celebrate the little things--especially if you grew them yourself.